If you remember, on Wednesday, DH and I stopped at Goodwill before I had a dental appointment and I had some treasures in my hand but ran out of time to pay for them and sadly had to leave them behind. Yesterday morning, I headed back to Goodwill and I am happy to say that they had two of the three things sitting right where I left them. I got my pink tray and little white platter but the shabby white tray was not there. So not giving up, I walked through the entire store to make sure someone didn't pick it up and then discard it somewhere else. (I do this alot!) But someone must've brought it, I couldn't find it. So what's a girl to do? Well it's not just take those two things and head home. Nope, I looked for more treasures and think I might have done better on Friday than I could have on Wednesday. Getting a head of myself, I went to WalMart and bought a bird nest and bird eggs for to set in my little cloche that I found for $2 - not bad for $6.30! I also found another little white platter to add to the three that I already found there! But, even though I was so impressed with all my finds, my greatest find were these three Willow Tree Figurines. I only bought one and left and then call my daughter and told her there were two more and she told me to head back and get the other two. So I headed back and they were still there! What somepeople give away is amazing! My three new Willow Tree figures - aren't they pretty - all for $22 - what a bargain! The guy at Goodwill said that they get these alot and they leave as fast as they set them out...ok - I'm definitely hooked on this Goodwill Store - but today I best stay home and do some cleaining. Before I get into my escapade from yesterday, I'm pleased to announce my daughter who gave me the yellow sewing box, started her very own blog this week - For The Love of Yellow. Crystal has always loved yellow so I was surprised that she would let me have the sewing box. She's getting ready to move a hour-and-a-half away but we'll stil get together to be bargain shopping. I've been showing Crystal all of wonderful blogs I've found and she's going to be blogging about moving and fixing up their new home. Yesterday I had a dental procedure done that I need my DH to drive me home afterwards. I asked if we could go to Goodwill before the dentist appt and he said we could. DH stayed in the car while I went looking and I was looking as quickly as possible. Right away found a cute shabby pink tray and then a shabby white tray..wow I thought I've hit the jackpot! Then I found this cute mini platter and knew my time was running out. There was only one person working and wouldn't you know it, the first gal was buying TOO DANG MANY glasses that had to be individually wrapped. By this time, I'm getting worried that my time is running out and here comes DH to say we have to go now - five minutes to my appointment. CRAP! I sadly put my treasures on a shelf and walked out looking back at them. I begged DH to go back after my appt and get my things and he said he thought I had a problem...WHATEVER..I did chuckle because I don't spend that much money and I could be spending so much more money if I headed to the mall. I've been dreaming of my finds from yesterday but the dentist ordered rest for today. I'm that thinking tomorrow morning that I'm going to head back to Goodwill to see if they're still there. What's the chance of that? I seriously doubt they'll be there but DH is fairly confident that they'll right where I sit them down. Have you ever had to leave something due to time constraints? Happy Tuesday! 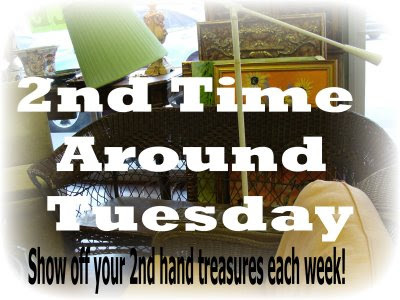 It's time again for Two or More Tuesday's & 2nd Time Around so head over to Gypsy's Corner & A Picture is Worth a 1,000 Words & check out all the other entries! I've become obsessed with Goodwill and stopped by on Saturday morning and again Sunday afternoon. Here's three or more of my treasures that I found this weekend...what do you think? I told my oldest daughter that she had to go check out this place and she found quite a few cute things. One is this cute yellow sewing box all shabbied up. I went on and on about how cute it was and she gave it to me...now that's the kind of daughter I love! Guess you know where I'll be Saturday morning, don't ya? Do you get a ton of junk email? I think it's called Spam, right? I'm from the generation that Spam is that fake meat but looks gross and smells even worse. 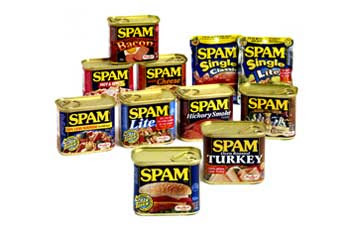 Ok - I'm not going to talk today about Spam. I've signed up for so many things online that my email is flooded with CRAP. I usually just delete and move on but this morning (I couldn't sleep and got up at 4:30) I went to check my email and I had 22 new emails to read! I decided this would be a great time to take the time to unsubscribe to all of these emails. The first email was entitle "Lifelong Health: Past 50, Everyone Needs a Comprehensive Physical." First of all I am not 50, I've got 2 looooooong years before I get to 50 so this email did not make me happy. You always have to go to the bottom of the email and in the littlest font, there's the section to unsubscibe. So what did I do? I started checking out the side bars and they had some freebies that did interest me so I checked them out and got a couple of things free that I'd like to pass on to you! I don't know about you but I love a bargain, but something FREE is even better. 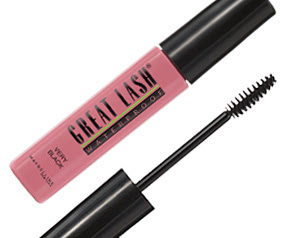 Check out these two freebies - Free Cheerios pick your flavor and Free Maybelline Mascara. The funny thing about this, I didn't unsubscribe - so I'll continue to get more SPAM! WOO HOO!! My good friend,Diane at Mom to Monkeys finds great bargains and alot of times free stuff too. So take a glimpse at her site, you never know what she's going to find for us! Happy Saturday - It's a perfect day! I love these posts that share things about each other and Dogs on Thursday is hosting appropriately enough - Dogs on Thursday! 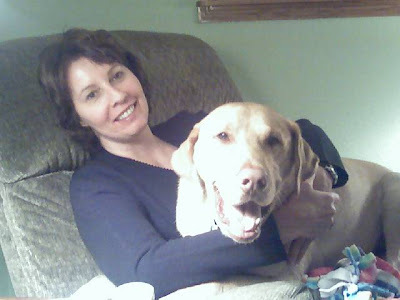 Be sure to check out the other dog lovers and enjoy a cute picture or two and possibly a heartwarming story. I'm a huge dog & cat lover and think we have the smartest dog around! It all started about three years ago, my daughter and I decided to volunteer at our local Humane Society and walk dogs and play with the cats. We'd show up on Saturday mornings and spend an hour there and go home wishing we could save all of the dogs & cats. Each week we find the perfect dog and I'd call DH on the cell phone and plead with him to leave work and come check out the most adorable dog that we had to have. We'd come home with stories of all the cute things we saw and Steve admited that he always wanted to have a dog. And so Steve researched the pets available online and found a picture of Storm. They told us that Storm had been at the Humane Society longer than any other dog and they couldn't figure out why because he was such a nice dog and very good natured. So one day I left work early and meet DH at the Humane Society and DH was already there walking Storm around and I knew - Storm was coming home with us!! We signed the paperwork and went and bought a doghouse, food, dishes, toys, treats - you name it - and it was so much fun! And we hurried to pick up Storm and head for home. We spent many nights sitting outside with Storm not sure if we could bring him in the house because of thee cats. Would he chase after them? Was he housetrained? What was going to happen to our house? But we let him in and he was perfect. He stayed beside us and didnt' pay any attention to the cats. In fact, the cats walked right up to him and loved him immediately. Storm now lives the life of luxury. We sold the dog house & kennel and Storm is not a house dog. He sleeps on our bed all day long and has the best view of the outside. It's not uncommon to see Storm and the three cats all on our bed napping together! We can't imagine what our life would be life if we didn't have our Storm. So here's some picturs of our wonderful dog, Storm! I encourage everyone to visit your local Humane Society - you'll never know how lucky you could be! Welcome to Three or More - Tuesday ! I bought this for my daughters birthday, she could live on tea! I just bought this one last weekend, I love the embossing..
What collection would be complete without something with a ktten or puppy? These two are on my dresser, the box was a gift from my daughter and son-in-law from their wedding - I put my wedding jewelry inside. Do you collect the Willow Tree figurines? Thanks for stopping by and don't forget to stop by Gypsy's Corner and check out more of "Three or More - Tuesday." Gone to Heaven at Goodwill! Well, I said I was going to go back to the Goodwill Store that DH and I went to last Sunday and Saturday morning I hit the jackpot. I was looking for anything white ceramic/ironstone/shabby chic...ok - I was open to whatever caught my eye. As I was leaving the house, I realized I didn't bring the camera with me but then I decided that it might be too weird to start taking pictures. I couldn't be happier and they are a tad dirty, so to the dishwasher some of them will go. Lamp for my office - $3 and the shade still has the plastic on it! Wal-Mart has this same lamp for $10! Not exactly sure what this is but Iloved the white ceramic and the bird not to mention the price of $1..thank you very much! I loved this little white bird - $1! And here's all of it together - $21! Not too shabby! One of the many things that I love about blogs is all the creative people that are out there. Today, over at Flat Wood Folk Art she's having a Valentine's Blog Party. 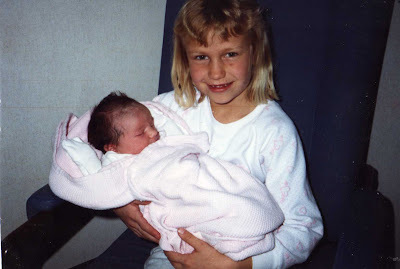 And so today, my Valentine Blog will be about my youngest daughter, Ashley who was born on Valentine's Day 19 years ago. 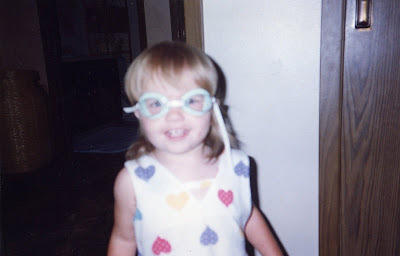 Ashley has always had a special place in my heart, really all my kids do but to be born on Valentine's Day is so nice. What could be more perfect than to have a baby on the day of love? 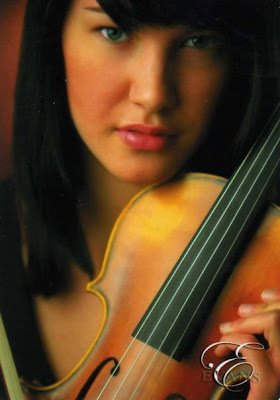 Here's my tribute to my beautiful daughter Ashley. We love you Ashley! Crystal was so excited that we were having a baby! My Valentine Swap Gift Arrived!